What is the Space Launch System? 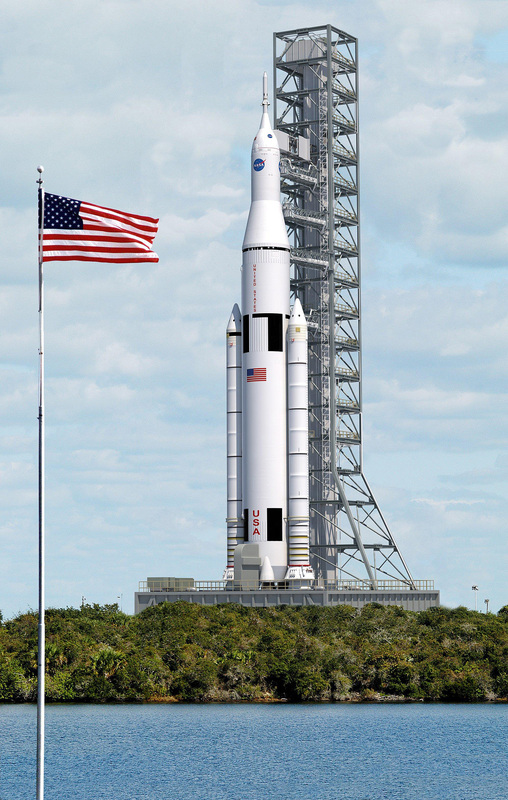 It’s NASA’s plan for a next generation space exploration vehicle, and it is built like a big puzzle by putting together the best of both the Saturn V that took men to the Moon and the Space Shuttle that for 30 years took us to low Earth orbit. Here’s a look at it. Let’s begin with the Space Shuttle. It had two huge rockets attached to its sides, we can save those SRBs (Solid Rocket Boosters), they gave the Shuttle much of the power it needed to leave the Earth behind. The Space Transportation System used liquid oxygen and hydrogen for combustion through its RS-25 engines, better known as SSMEs or Space Shuttle Main Engines, let’s get rid of that name but keep the engines. How about the Saturn V? The whole command and service module idea worked pretty well, but let’s expand it to fit four people instead of three. This development is already in the making with the Multi-Purpose Crew Vehicle or Orion. Since we’re going to have people on board, a launch abort system like the one used on the Saturn V seems like a smart idea. The Saturn V used J-2 engines in the second stage. Perhaps we can reuse those. Now what do we get if we put all of these parts together? A vehicle with the most lift capability of any past, present or planned vehicle. The SLS comes in a 70 metric ton and a 130 metric ton configurations The 70 metric ton rocket will use four or five RS-25 engines and two SRBs, along with the Orion crew capsule. The 130 ton configuration is similar but it adds an upper stage that uses two J-2X engines, which are a more efficient and simpler to build version of Apollo’s J-2 engines. These were originally developed for the now defunct Constellation programm, but are now being repurposed for the SLS. The SLS was designed to be flexible. No one is certain of what will be NASA’s next move. There are plans out there for Mars, the Moon and even asteroids. The SLS is flexible enough to fit the needs for any of those missions. If needed, SLS could even travel to the ISS just like the Space Shuttle did. Development of the SLS is an ongoing process. NASA has already scheduled Exploration Mission 1, its first launch for 2017. This mission would carry an unmanned Orion capsule, with the purpose of testing the integration and general performance of the spacecraft, before adding humans to the equation. Exploration Mission 2 is planned for 2021. This one would be a manned launch on a lunar orbit flyby with a crew of up to four on board the Orion capsule. The Space Launch System is the point where NASA’s history and future meet. With proven hardware and new technologies it plans to take us further that we have ever been before, both in distance and in knowledge. There are still a lot of uncertainties, but there is also time to figure them out. We are at an exciting moment in the development of this spacecraft, but we have to wait and see. This article appeared in the January 2013 issue of RocketSTEM.